All types of motorsports – including snowmobiling – are high-adrenalin, action sports. And adaptive snowmobiling is no exception. The sport is continuing to grow, as an increasing number of ski areas and winter adventure companies offer modified snowmobiles and guide trips, enabling people with physical disabilities to experience the thrill, breathtaking scenery, and enjoyment that snowmobiling offers. In 1960, Joseph-Armand Bombardier invented the first modern snowmobile, giving many the opportunity to traverse snowy terrain for the first time. Over the last few decades, after many innovations, these winter sports vehicles have become more powerful and comfortable – and accessible to people with disabled users. In 2010, a Montreal, Canada entrepreneur and avid snowmobiler began modifying snowmobiles with hand controls, special seats, and other accessible equipment to open the world of snowmobiling to people who use wheelchairs. For example, to accommodate an individual with paraplegia, the snow vehicle modifications involves retrofitting a special chair with a back and an attachment for the feet. Adaptive or accessible snowmobiling is offered in many major ski areas around the world. 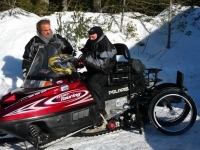 Specialized companies provide snowmobiles with different types of modifications to serve people with a range of needs and conditions from paraplegia and hemiplegia to amputation. The end goal is to allow everyone the opportunity to drive a snowmobile and enjoy an exhilarating ride through the snow. Most snowmobiles only require small modifications to be used people with physical challenges. To help maximize the adventure experience and ensure safety, vehicle instruction and trained guides are present at every journey to provide assistance. 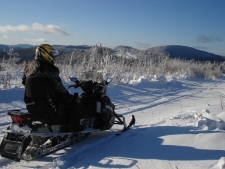 Typically, snowmobile companies offer hundreds of miles of trails for snowmobilers. Guides lead trips covering all types of snowy terrain. Hourly, half-day and specialty tours are available, based on the company and ski area. While many winter sport lovers enjoy snowmobiling for recreational use, other competitive wheelchair users participate in snowmobile races and extreme riding, which requires additional vehicle adaptations for enhanced shock resistance and to allow for swiveling and leaning from side to side.